Are you a Rough or Smooth Collie owner involved in, or interested in, working your Collie in Obedience, Agility and such-like activities? 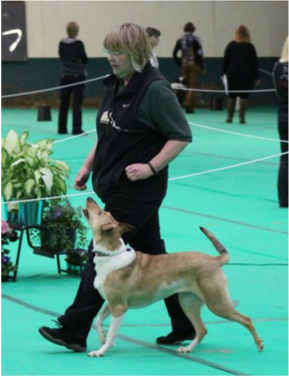 If so, then you may also be interested in The Rough and Smooth Collie Training Association. This Association was formed in the early 1990's, initially under the name of The Working Rough and Smooth Collie Association, by a group of individuals who were united in wanting to see these Collies active in areas other than just the show ring. They wanted to see them taking part in all kinds of working activities. Eventually in 1993, the Association gained Kennel Club recognition and became a Registered Society. At the request of The Kennel Club, the name was changed to The Rough & Smooth Collie Training Association. Now, with a growing membership, the RSCTA organises its own events around the country to encourage members to work their Collies in activities such as Agility, Obedience, Flyball, Working Trials and Herding, and to have their dogs tested for The Kennel Club Good Citizen Scheme and for Character Assessment. Work as a PAT Dog, Hearing Dog for the Deaf, Dog for the Disabled, or as any other assistant to man is also encouraged. Both versatility and achievement are rewarded. Notwithstanding its name, the RSCTA is not really a training organisation, although its activities occasionally include some initial training more as an introduction than anything else. Membership is open to anyone, anywhere, as long as they support its aims, whether or not they actually take part in the organised events - though we hope most will want to do so. All standards are welcome, from the simply amateur to the seriously committed. With a wide spread of collie interest and experience within the Association, help and advice are available to members and non-members alike on anything concerning our two breeds.